The memorandum of understanding signing ceremony between PLUS EXPRESSWAYS BERHAD and NEXCO-CENTRAL, Central Nippon Expressway Company Limited, Japan, was held at the Headquarters of PLUS on 12th February 2009 witnessed by YBhg. Dato’ Sri Dr. Abdul Munit bin Kasmin, Secretary General, Ministry of Works on behalf of the Minister of Works and H.E. 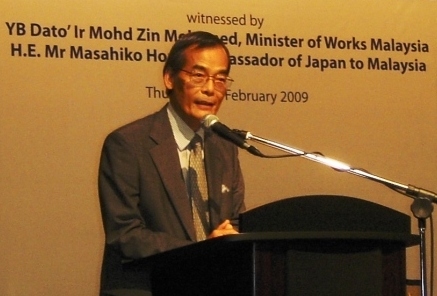 Masahiko HORIE, Ambassador of Japan to Malaysia. Both parties will exchange their staffs for around six months under this MOU in order to learn from each other expertise such as advanced highway management and maintenance systems, embarkation onto abroad toll road projects. They will also seek mutual cooperation for R&D and in some other fields. “In the future, I hope that this MOU will become a stepping stone for a stronger relationship which contributes to new and exciting project-undertakings for both parties and they will present a good model of new type of mutual cooperation between Malaysia and Japan”, H.E. Masahiko HORIE, Ambassador of Japan to Malaysia said in his speech at the ceremony. NEXCO-CENTRAL, former JH, Japan Highway Public Corporation which was one of government agencies, had contributed to the development of highways which supported the economic and social development of Malaysia, through technical transfers by seconding their 17 staffs as JICA experts under the Japanese ODA for 29 years from 1973 to 2002. It was privatized in 2005 from JH and provides highway services for the length of 1,757km around in the central region of Japan. PLUS EXPRESSWAYS BERHAD, privatized in 1989, not only having provided excellent highway services for the length of 973km in Peninsula Malaysia, but has also embarked on highway projects in other countries such as India and Indonesia.